The university is located in the city of Calgary, where more than half of the most esteemed corporations in Canada are headquartered. The school is not only a member of the nine national centers of research excellence, but it is also the nation’s only first-rate educational center. The academic research achievements, high-quality of faculty and students, and annual research funds of over US$170M, have brought the university to become the World Tourism Organization recognized center for international study and research, which is the only center outside Europe; currently, there are over 1200 international students from 89 countries studying at the university, presenting a diversity of cultures. 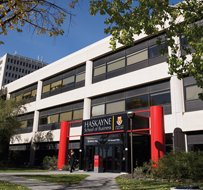 Founded in 1967, Haskayne School of Business is one of the 8 business colleges in Canada accredited by AACSB. Its first-class teaching research and the proven management and leadership are internationally recognized. In the recent years, the school has partnered with University of Alberta for joint managerial MBA and philosophy PhD programs, and collaborated with OLADE (Latin American Energy Organization) in offering a cross-disciplinary master's degree program, in Quito, Ecuador, in the field of energy and environment, providing a wide range of degree programs. The University of Strathclyde Business School was established in 1796.